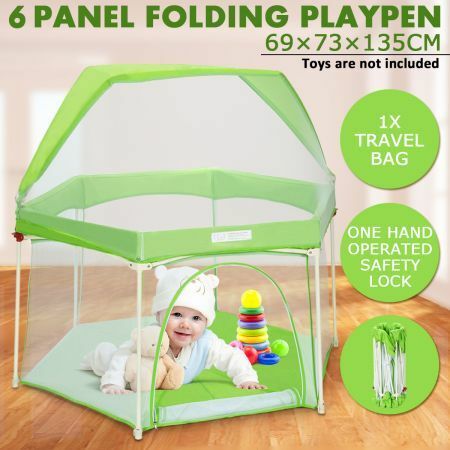 Searching for the best playpen which can be popped up in seconds with extremely easy portability? Our newly launched Pop-up Baby Puppy Playpen Foldable 6-Panel Play Pen Metal Frame with Awning – Green will be your ultimate solution. The dog playpen is already perfectly assembled, so the only thing you need to do is unfold it, within seconds, while using. Another character is that this play pen can be set up both indoors and outdoors. The thoughtful designed door makes access easier for your beloved ones. The base filled with cotton ensures a softer and safer area for your pets. Featuring visible mesh sides and an awning, this child playpen adds another level of protection for your lovely pets. Equipped with a metal frame and safety locks, the child playpen is also able to provide a safe playing area for your baby (under adults' supervision). In addition, keeping clean is no problem as this foldable playpen can be detachable and washable. Supplied with 1 travel bag with strap for easy storage and transportation. Buy the cheap playpen now for indoors or outdoors usage. Folding Metal Frame Comes Fully Assembled. Absolutely brilliantgreat quality productnot as easy to put up as advertised but completely manageable once you know what your doing.slightly heavier than I thought it would be.love that the awning and netting completely enclosed the pen.fast shipment and deliveryordered Sunday and arrived lunch time Tuesday. A big thumbs up from me.